Once again, the weekend is almost over. And I'm just now getting around to posting. I have good reasons, though. My crafting friends and I went to the Scrapbook Expo on Friday. What a fun day, with fun friends! I'm so blessed by their friendships. I've also spent a lot of time at my craft table. Several items for customers, but I also created a couple of sympathy cards. These, unfortunately, need to be sent out right away. This first card (I'll be posting the other card right away) is going into 3 challenges. The Movement Challenge at the Moxie Fab World - Cath has SO many fun challenges going on right now. If only I had time to play along in all of them! 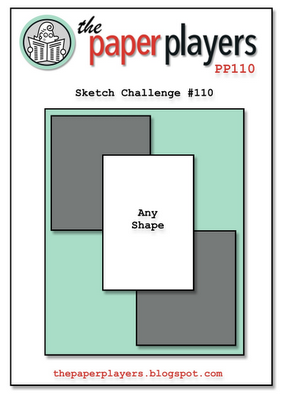 The Paper Players Sketch Challenge PP110 - LeAnne has given us quite an interesting sketch to inspire us. The tree stamp that I used is actually from the Love & Marriage stamp set by PTI. But, I think it works very well on a sympathy card. 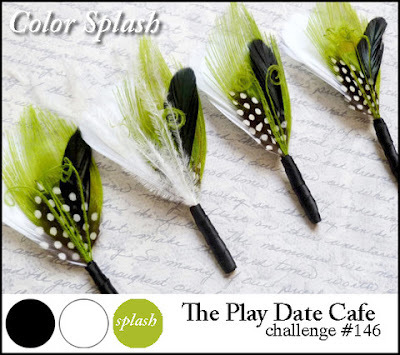 I colored in a few random leaves with a lucky limeade marker....the same color as the sentiment panel. I love the clean crisp look of black and white with just a splash of lime. Simple but striking. Gorgeous card Susie! I love your take on the sketch with the stamped background and the pop of lime in the leaves is beautiful! Thank you for joining us at The Paper Players! Great combo on the challenges! This tree is fabulous especially with the 'splash' of lime! oh my! This is beautiful! I love how you've coloured only a few leaves green!!! I saw this last night while skimming through my Reader but didn't realize is was for my sketch until this morning. GORGEOUS! Love those colors together, and although it is sad you had to make a sympathy card, it is beautiful and will be well-appreciated. I particularly like that little stamp you used for your corner images.....gonna have to check that one out! Glad you were able to play with my sketch this week at the Paper Players! What a very nice card, these are always hard cards for me to make. Thanks for playing along with week at The Play Date Cafe! It's a gorgeous tree image, and perfect for this card. Love the layers. What an awesome card - I adore how you went out of the box and used the stamped images for the corner boxes! Ahhhh. Perfect! Love the CAS card - right up my alley! Glad you joined us at The Paper Players! Beautiful card! The stamping is fantastic. I like how you popped up the center panel, too. Thanks for joining us at The Play Date Cafe! It's gorgeous...thanks for playing with us at The Play Date Cafe!